We mention the phrase Mechanical Sympathy quite a lot, in fact it's even Martin's blog title. It's about understanding how the underlying hardware operates and programming in a way that works with that, not against it. We get a number of comments and questions about the mysterious cache line padding in the RingBuffer, and I referred to it in the last post. Since this lends itself to pretty pictures, it's the next thing I thought I would tackle. One of the things I love about working at LMAX is all that stuff I learnt at university and in my A Level Computing actually means something. So often as a developer you can get away with not understanding the CPU, data structures or Big O notation - I spent 10 years of my career forgetting all that. But it turns out that if you do know about these things, and you apply that knowledge, you can come up with some very clever, very fast code. So, a refresher for those of us who studied this at school, and an intro for those who didn't. Beware - this post contains massive over-simplifications. The CPU is the heart of your machine and the thing that ultimately has to do all the operations, executing your program. Main memory (RAM) is where your data (including the lines of your program) lives. We're going to ignore stuff like hard drives and networks here because the Disruptor is aimed at running as much as possible in memory. 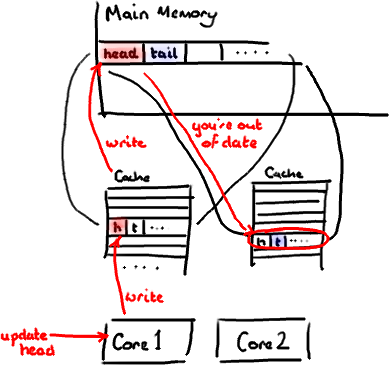 The CPU has several layers of cache between it and main memory, because even accessing main memory is too slow. If you're doing the same operation on a piece of data multiple times, it makes sense to load this into a place very close to the CPU when it's performing the operation (think a loop counter - you don't want to be going off to main memory to fetch this to increment it every time you loop around). 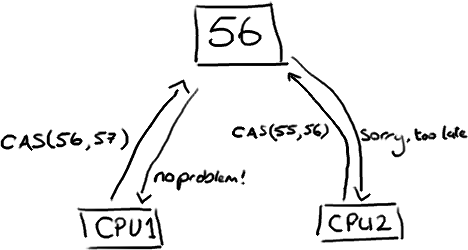 The closer the cache is to the CPU, the faster it is and the smaller it is. 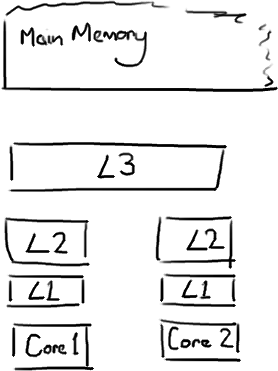 L1 cache is small and very fast, and right next to the core that uses it. L2 is bigger and slower, and still only used by a single core. L3 is more common with modern multi-core machines, and is bigger again, slower again, and shared across cores on a single socket. Finally you have main memory, which is shared across all cores and all sockets. When the CPU is performing an operation, it's first going to look in L1 for the data it needs, then L2, then L3, and finally if it's not in any of the caches the data needs to be fetched all the way from main memory. The further it has to go, the longer the operation will take. So if you're doing something very frequently, you want to make sure that data is in L1 cache. If you're aiming for an end-to-end latency of something like 10 milliseconds, an 80 nanosecond trip to main memory to get some missing data is going to take a serious chunk of that. Now the interesting thing to note is that it's not individual items that get stored in the cache - i.e. it's not a single variable, a single pointer. 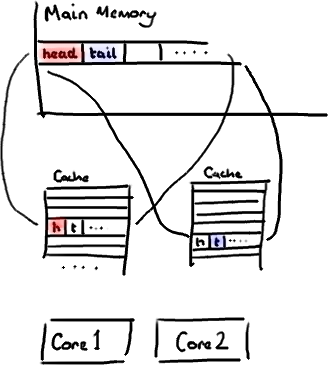 The cache is made up of cache lines, typically 64 bytes, and it effectively references a location in main memory. A Java long is 8 bytes, so in a single cache line you could have 8 long variables. This is brilliant if you're accessing an array of longs - when one value from the array gets loaded into the cache, you get up to 7 more for free. So you can walk that array very quickly. 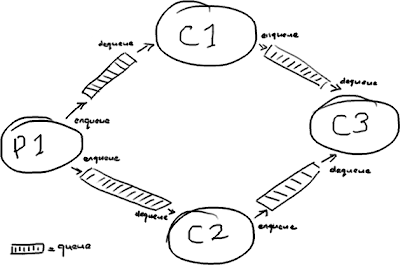 In fact, you can iterate over any data structure that is allocated to contiguous blocks in memory very quickly. I made a passing reference to this in the very first post about the ring buffer, and it explains why we use an array for it. 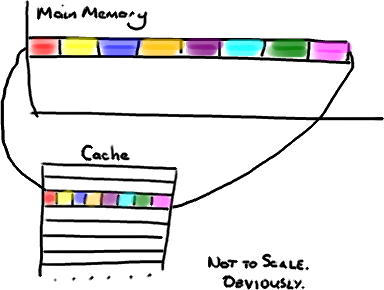 So if items in your data structure aren't sat next to each other in memory (linked lists, I'm looking at you) you don't get the advantage of freebie cache loading. You could be getting a cache miss for every item in that data structure. However, there is a drawback to all this free loading. Imagine your long isn't part of an array. Imagine it's just a single variable. Let's call it head, for no real reason. Then imagine you have another variable in your class right next to it. Let's arbitrarily call it tail. Now, when you load head into your cache, you get tail for free. Which sounds fine. Until you realise that tail is being written to by your producer, and head is being written to by your consumer. These two variables aren't actually closely associated, and in fact are going to be used by two different threads that might be running on two different cores. Imagine your consumer updates the value of head. The cache value is updated, the value in memory is updated, and any other cache lines that contain head are invalidated because other caches will not have the shiny new value. And remember that we deal with the level of the whole line, we can't just mark head as being invalid. 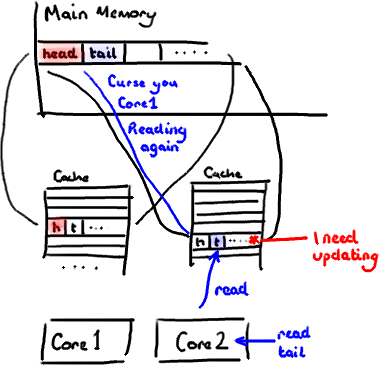 Now if some process running on the other core just wants to read the value of tail, the whole cache line needs to be re-read from main memory. So a thread which is nothing to do with your consumer is reading a value which is nothing to do with head, and it's slowed down by a cache miss. Of course this is even worse if two separate threads are writing to the two different values. Both cores are going to be invalidating the cache line on the other core and having to re-read it every time the other thread has written to it. You've basically got write-contention between the two threads even though they're writing to two different variables. This is called false sharing, because every time you access head you get tail too, and every time you access tail, you get head as well. All this is happening under the covers, and no compiler warning is going to tell you that you just wrote code that's going to be very inefficient for concurrent access. You'll see that the Disruptor eliminates this problem, at least for architecture that has a cache size of 64 bytes or less, by adding padding to ensure the ring buffer's sequence number is never in a cache line with anything else. So there's no false sharing, no unintended contention with any other variables, no needless cache misses. It's worth doing this on your Entry classes too - if you have different consumers writing to different fields, you're going to need to make sure there's no false sharing between each of the fields. EDIT: Martin wrote a more technically correct and detailed post about false sharing, and posted performance results too. Martin Fowler has written a really good article describing not only the Disruptor, but also how it fits into the architecture at LMAX. This gives some of the context that has been missing so far, but the most frequently asked question is still "What is the Disruptor?". I'm working up to answering that. I'm currently on question number two: "Why is it so fast?". These questions do go hand in hand, however, because I can't talk about why it's fast without saying what it does, and I can't talk about what it is without saying why it is that way. So I'm trapped in a circular dependency. A circular dependency of blogging. To break the dependency, I'm going to answer question one with the simplest answer, and with any luck I'll come back to it in a later post if it still needs explanation: the Disruptor is a way to pass information between threads. 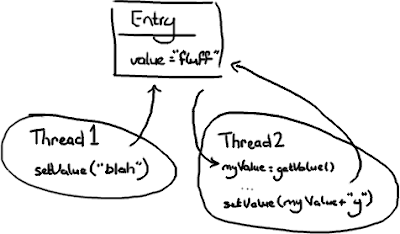 As a developer, already my alarm bells are going off because the word "thread" was just mentioned, which means this is about concurrency, and Concurrency Is Hard. The value changes to "blah"
Then the value changes to "blahy" when Thread 2 gets there. The value changes to "fluffy"
Then the value changes to "blah" when Thread 1 gets there. Thread 1 goes in and updates value to "blah"
Then Thread 2 wakes up and sets the value to "fluffy". Case Three is probably the only one which is definitely wrong, unless you think the naive approach to wiki editing is OK (Google Code Wiki, I'm looking at you...). In the other two cases it's all about intentions and predictability. Thread 2 might not care what's in value, the intention might be to append "y" to whatever is in there regardless. In this circumstance, cases one and two are both correct. But if Thread 2 only wanted to change "fluff" to "fluffy", then both cases two and three are incorrect. 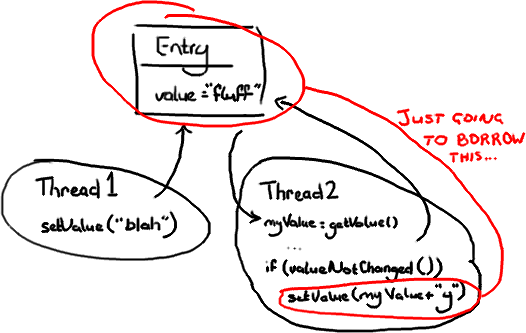 Assuming that Thread 2 wants to set the value to "fluffy", there are some different approaches to solving the problem. In this case Thread 2 will only lock Entry when it needs to write to it. In order to make this work, it needs to check if Entry has changed since it first looked at it. 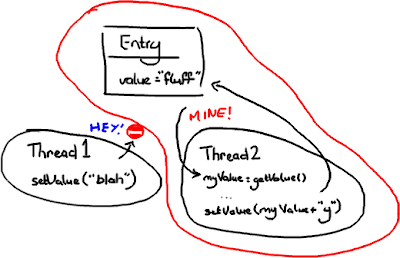 If Thread 1 came in and changed the value to "blah" after Thread 2 had read the value, Thread 2 couldn't write "fluffy" to the Entry and trample all over the change from Thread 1. 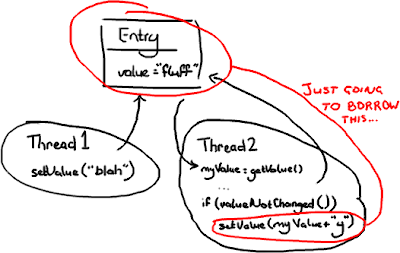 Thread 2 could either re-try (go back, read the value, and append "y" onto the end of the new value), which you would do if Thread 2 didn't care what the value it was changing was; or it could throw an exception or return some sort of failed update flag if it was expecting to change "fluff" to "fluffy". An example of this latter case might be if you have two users trying to update a Wiki page, and you tell the user on the other end of Thread 2 they'll need to load the new changes from Thread 1 and then reapply their changes. If you've used an over-zealous locking technique, both threads are going to sit there forever waiting for the other one to release its lock on the resource. That's when you reboot Windows your computer. The thing about locks is that they need the operating system to arbitrate the argument. The threads are like siblings squabbling over a toy, and the OS kernel is the parent that decides which one gets it. It's like when you run to your Dad to tell him your sister has nicked the Transformer when you wanted to play with it - he's got bigger things to worry about than you two fighting, and he might finish off loading the dishwasher and putting on the laundry before settling the argument. If you draw attention to yourself with a lock, not only does it take time to get the operating system to arbitrate, the OS might decide the CPU has better things to do than servicing your thread. The Disruptor paper talks about an experiment we did. The test calls a function incrementing a 64-bit counter in a loop 500 million times. For a single thread with no locking, the test takes 300ms. If you add a lock (and this is for a single thread, no contention, and no additional complexity other than the lock) the test takes 10,000ms. That's, like, two orders of magnitude slower. Even more astounding, if you add a second thread (which logic suggests should take maybe half the time of the single thread with a lock) it takes 224,000ms. Incrementing a counter 500 million times takes nearly a thousand times longer when you split it over two threads instead of running it on one with no lock. Naive code can have unintended consequences. Case Three above is an example of how things can go horribly wrong if you don't realise you have multiple threads accessing and writing to the same data. This is why many organisations have some sort of concurrency problems in their interview process (certainly for Java interviews). Unfortunately it's very easy to learn how to answer the questions without really understanding the problem, or possible solutions to it. For a start, it doesn't use locks. At all. 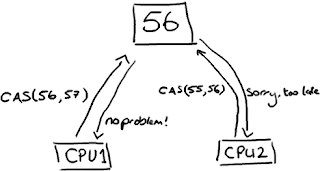 Instead, where we need to make sure that operations are thread-safe (specifically, updating the next available sequence number in the case of multiple producers), we use a CAS (Compare And Swap/Set) operation. This is a CPU-level instruction, and in my mind it works a bit like optimistic locking - the CPU goes to update a value, but if the value it's changing it from is not the one it expects, the operation fails because clearly something else got in there first. CAS operations are much cheaper than locks because they don't involve the operating system, they go straight to the CPU. But they're not cost-free - in the experiment I mentioned above, where a lock-free thread takes 300ms and a thread with a lock takes 10,000ms, a single thread using CAS takes 5,700ms. So it takes less time than using a lock, but more time than a single thread that doesn't worry about contention at all. Back to the Disruptor - I talked about the ClaimStrategy when I went over the producers. In the code you'll see two strategies, a SingleThreadedStrategy and a MultiThreadedStrategy. You could argue, why not just use the multi-threaded one with only a single producer? Surely it can handle that case? And it can. But the multi-threaded one uses an AtomicLong (Java's way of providing CAS operations), and the single-threaded one uses a simple long with no locks and no CAS. 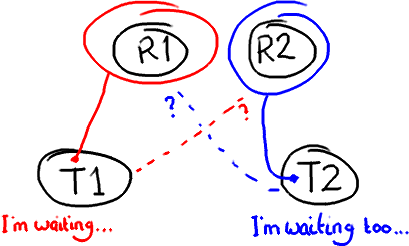 This means the single-threaded claim strategy is as fast as possible, given that it knows there is only one producer and therefore no contention on the sequence number. I know what you're thinking: turning one single number into an AtomicLong can't possibly have been the only thing that is the secret to the Disruptor's speed. And of course, it's not - otherwise this wouldn't be called "Why it's so fast (part one)". But this is an important point - there's only one place in the code where multiple threads might be trying to update the same value. Only one place in the whole of this complicated data-structure-slash-framework. And that's the secret. Remember everything has its own sequence number? If you only have one producer then every sequence number in the system is only ever written to by one thread. That means there is no contention. No need for locks. No need even for CAS. The only sequence number that is ever written to by more than one thread is the one on the ClaimStrategy if there is more than one producer. This is also why each variable in the Entry can only be written to by one consumer. It ensures there's no write contention, therefore no need for locks or CAS. If more than one producer wants to place something on the queue, the tail pointer will be a point of contention as more than one thing wants to write to it. If there's more than one consumer, then the head pointer is contended, because this is not just a read operation but a write, as the pointer is updated when the item is consumed from the queue. There's another thing to bear in mind with queues/buffers. The whole point is to provide a place for things to hang out between producers and consumers, to help buffer bursts of messages from one to the other. This means the buffer is usually full (the producer is out-pacing the consumer) or empty (the consumer is out-pacing the producer). It's rare that the producer and consumer will be so evenly-matched that the buffer has items in it but the producers and consumers are keeping pace with each other. The queue needs a size so that it can tell the difference between empty and full. Or, if it doesn't, it might determine that based on the contents of that entry, in which case reading an entry will require a write to erase it or mark it as consumed. Whichever implementation is chosen, there's quite a bit of contention around the tail, head and size variables, or the entry itself if a consume operation also includes a write to remove it. On top of this, these three variables are often in the same cache line, leading to false sharing. So, not only do you have to worry about the producer and the consumer both causing a write to the size variable (or the entry), updating the tail pointer could lead to a cache-miss when the head pointer is updated because they're sat in the same place. I'm going to duck out of going into that in detail because this post is quite long enough as it is. So this is what we mean when we talk about "Teasing Apart the Concerns" or a queue's "conflated concerns". By giving everything its own sequence number and by allowing only one consumer to write to each variable in the Entry, the only case the Disruptor needs to manage contention is where more than one producer is writing to the ring buffer. No contention = no locks = it's very fast. So now I've covered the ring buffer itself, reading from it and writing to it. I talked about multiple producers - they have the producer barrier to keep them in order and under control. I've talked about consumers in a simple situation. Multiple consumers can get a little more involved. 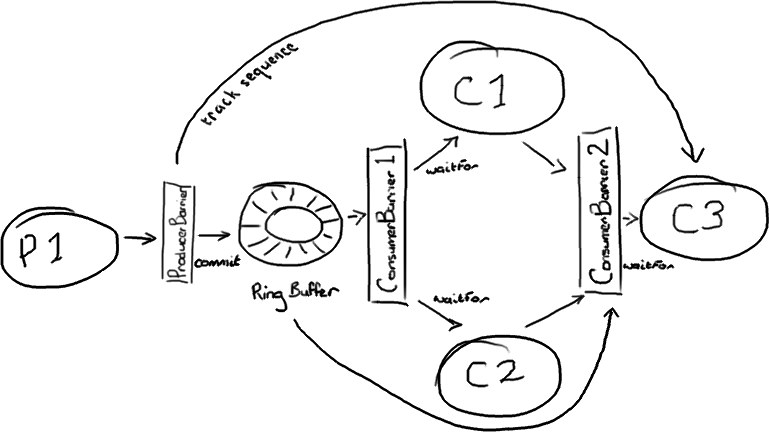 We've done some clever stuff to allow the consumers to be dependent on each other and the ring buffer. Like a lot of applications, we have a pipeline of things that need to happen before we can actually get on with the business logic - for example, we need to make sure the messages have been journalled to disk before we can do anything. The Disruptor paper and the performance tests cover some basic configurations that you might want. I'm going to go over the most interesting one, mostly because I needed the practice with the graphics tablet. DiamondPath1P3CPerfTest illustrates a configuration which is not too uncommon - a single producer with three consumers. The tricky point being that the third consumer is dependent upon the previous two consumers to finish before it can do anything. (Why does queue have to have so many "e"s? It's the letter I have the most trouble with in these drawings). It does look more complicated. But the ring buffer remains the single point of contact between all the players, and the interactions are all based on the barriers checking the sequence numbers of the things it's dependent upon. The producer side is fairly simple, it's the single producer model described in my last post. Interestingly, the producer barrier doesn't have to care about all the consumers. 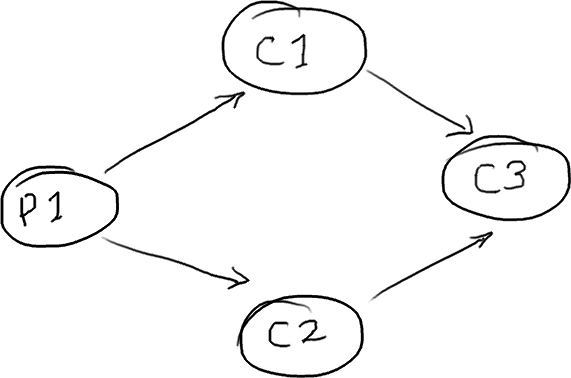 It only cares about consumer three, because if consumer three has finished with an item in the ring buffer the other two will already have processed it. So if C3 has moved on, that slot in the ring buffer is available. Hmm. I can see I'm going to need an example. We're joining the party halfway through the story: the producer has filled the ring buffer up to sequence number 22; consumer one has read and processed everything up to 21; consumer two has processed everything up to sequence 18; consumer three, which is dependent upon the other consumers, has only made it as far as 15. The producer can't write anything more to the ring buffer because sequence 15 is taking up the slot where we'd want to put sequence 23. (I'm sorry, I really did try to find an alternative to red and green, but everything else was just as ambiguous). Note that the consumers are still reading the entries directly from the ring buffer - consumers one and two are not taking the entries off the ring buffer and then passing them on to consumer three. Instead, the second consumer barrier is letting consumer three know which entry in the ring buffer it's safe to process. This raises a question - if everything comes directly off the ring buffer, how is consumer three going to find out about anything the first two consumers have done? If all consumer three cares about is that the earlier consumers have done their job (e.g. replicating the data to somewhere else) then everything's fine - when consumer three is told the job is done, it's happy. If, however, consumer three needs the results of an earlier consumer's processing, where does it get that from? The secret is to write them to the ring buffer Entry itself. This way, when consumer three grabs the entry off the ring buffer, it will have been populated with all the information consumer three needs to do the job. The really important part of this is that for each field on the Entry only one consumer is allowed to write to it. This prevents any write-contention which will slow the whole thing down. 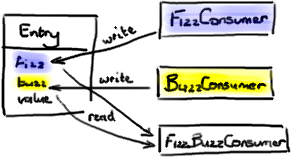 You can see this in DiamondPath1P3CPerfTest - FizzBuzzEntry has two fields as well as the value: fizz and buzz. If the consumer is a Fizz consumer, it writes to fizz. If it's a Buzz consumer, it writes to buzz. The third consumer, FizzBuzz, will read both of these fields but not write to either, since reading is fine and won't cause contention. EDIT 2: Note that version 2.0 of the Disruptor uses different names to the ones in this article. Please see my summary of the changes if you are confused about class names. Also Adrian's DSL is now part of the main Disruptor code base. EDIT: The most recent version of the RingBuffer hides away the Producer Barrier. If you can't see a ProducerBarrier in the code you're looking at, then assume where I say "producer barrier" I mean "ring buffer"
EDIT 2: Note that version 2.0 of the Disruptor uses different names to the ones in this article. Please see my summary of the changes if you are confused about class names.